At a speech last week, Obama praised “Medicare for All” as a “good new idea.” The Weekly Standard pounces, declaring conservatives were right all along about Obama’s sinister socialistic plot. 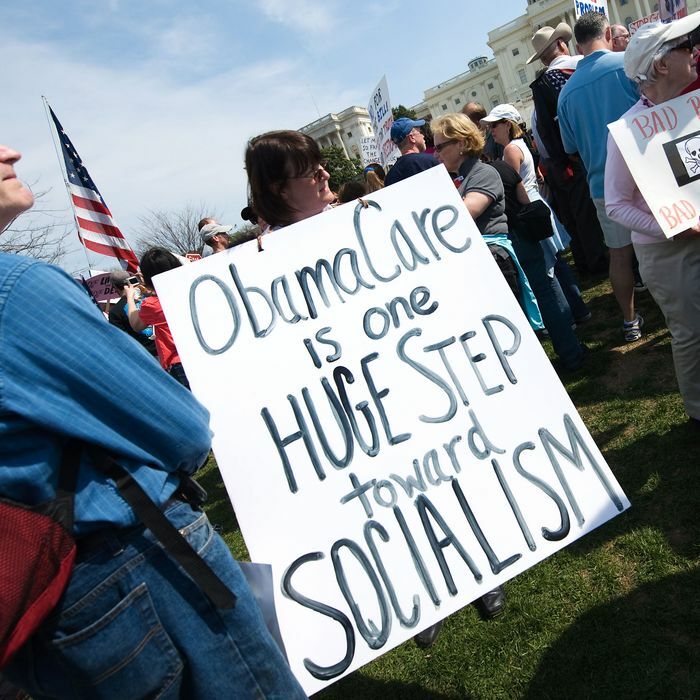 “Obama admitted — finally —that he favors nationalizing the health-care industry,” concludes the conservative magazine. So, first of all, “Medicare for All” does not necessarily mean “nationalizing the health-care industry. Nationalizing the health-care industry would mean something like the British National Health Service, in which hospitals and doctors work are public employees. A complete single-payer system would leave medical providers private, while putting the government in charge of insurance. And Medicare for All doesn’t even mean that, either. The phrase has different meanings, some of which would keep employer-based insurance while allowing individuals or firms the choice of buying into Medicare. It doesn’t necessarily mean single payer, and it absolutely doesn’t indicate nationalizing the health-care system. Unsurprisingly, the Standard, like virtually the entire conservative movement, is ignorant of the details and treats every left-of-center plan as the same. But even if it were true that Obama is endorsing single-payer insurance, it is worth considering the context of his remarks. Lots of things have happened since Obamacare was passed. Most importantly, the conservative movement launched a hysterical political and legal sabotage campaign, using every tool from concocting frivolous lawsuits to driving insurance firms out of the markets by eliminating the outreach budget and withholding promised reimbursements. That sabotage campaign is still ongoing. It would be extremely reasonable for a liberal who favors Obama-Romney-style subsidized private insurance to conclude that market-based insurance is simply too vulnerable to right-wing sabotage, and the only safe path for covering people who can’t afford their own insurance is through public programs. One of the things conservatives have been completely oblivious to is the degree to which their manic uncompromising stance has strengthened the case for more left-wing health-care reforms within the Democratic Party while undermining the basis for more moderate ones. Obama implemented a moderate, market-based health-care reform. Conservatives freaked out, called it socialism, and threw themselves into a campaign to destroy it by making market-based reforms legally and commercially vulnerable. So then Obama is responding by proposing a more government-based reform that can withstand these attacks. And the right’s response to these events is … to conclude they were right all along to accuse Obamacare of being a secret socialist plot.